On October 5th, 2017, we had the privilege to announce a very special gift that demonstrates the power of philanthropy for research that aims to transform care. A Victoria family who has been impacted by cognitive health issues stepped forward to inspire Island Health, the University of Victoria and the University of British Columbia to partner and develop The Neil and Susan Manning Cognitive Health Initiative. To fund the program the Mannings have made a generous pledge of $2.5 million to the Victoria Hospitals Foundation. 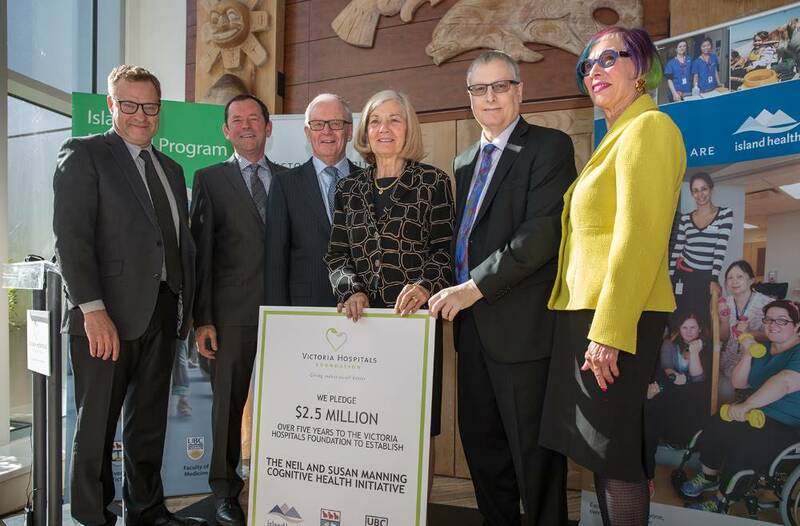 Through this Initiative, Island Health, the University of Victoria and the University of British Columbia’s Island Medical Program will come together for the first time on a joint research project. Collectively, they aim to improve the diagnosis and treatment of dementia. This visionary project will see the development of state-of-the-art digital tools for early diagnosis, the integration of research protocols into patient care, and the tracking of dementia patients throughout Vancouver Island into a single real-time Dementia Guidance System database that will cluster patient’s symptoms, treatment plans and outcomes. Over time, these tools will be available for use by family physicians to assist with early diagnosis and care across Vancouver Island.